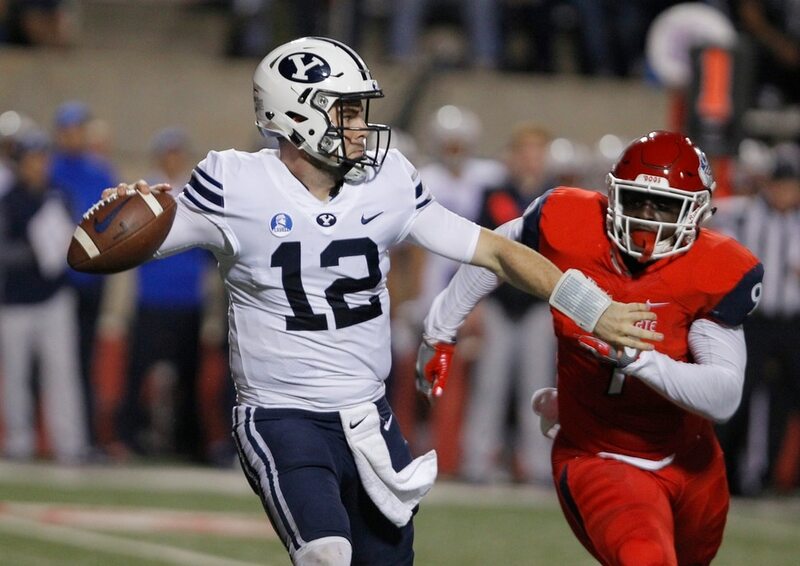 Fresno, Calif. • BYU’s modest winning streak didn’t last on Saturday night, and neither did its starting quarterback. 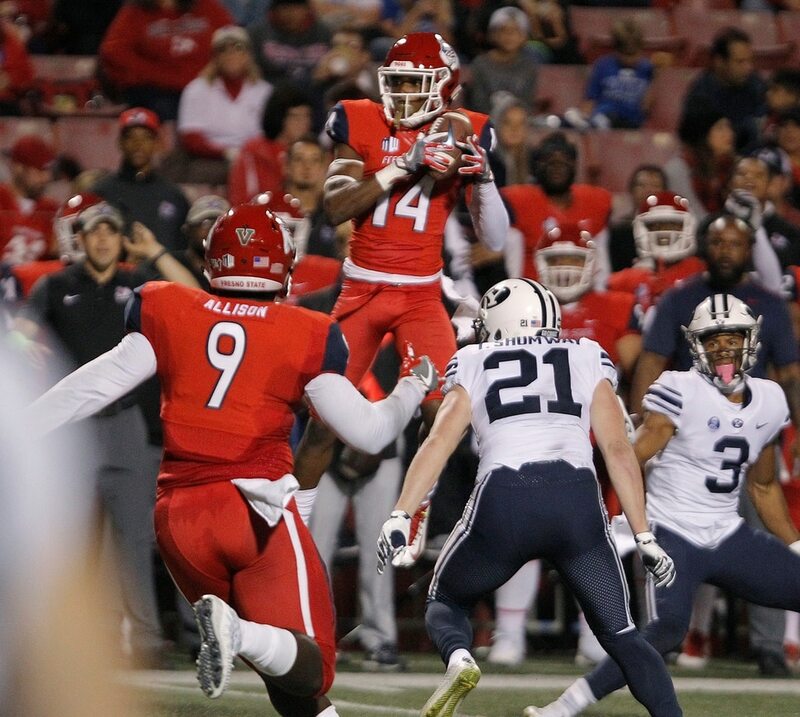 Tanner Mangum went down with a season-ending Achilles injury in the fourth quarter, and Fresno State held on to down the Cougars 20-13 at Bulldog Stadium. Mangum was 20 of 33 for 163 yards when he left the game with just over 10 minutes remaining. Sophomore Beau Hoge came on in relief with the Cougars trailing by a touchdown, but could not deliver the win. Fresno State improved to 6-3 and became bowl eligible, a season after going 1-11. Mangum suffered the injury to his right Achilles while he was stepping up to deliver a pass, and was not hit on the play. He had missed two earlier games with a left ankle sprain. He was on crutches leaving the locker room. Hoge, who had briefly spelled Mangum in the first half when the starter limped off the field before halftime, drove the Cougars to the Fresno State 27 with under six minutes remaining. However, his fourth-down pass was deflected by Fresno State’s George Helmuth and fell incomplete. The Cougars got the ball back with 3:21 remaining at their own 5, but tight end Matt Bushman fumbled after his ninth catch and Fresno State recovered, then ran out the clock. The Cougars (2-8) will be home for the holidays for the first time since 2004, coach Gary Crowton’s final season. The Cougars had 336 yards of offense, but misfired several times in the red zone in the first half and settled for field goals. Fresno State had 310 yards, about 100 less than its average, but did not commit a turnover. “It wasn’t good enough,” Sitake said of BYU’s defense, which gave up several big passing plays. The Bulldogs took a 13-6 lead on their third field goal with 10:07 remaining in the third quarter, but the Cougars promptly drove 75 yards in 11 plays to tie it at 13 with 4:28 left in the third. A 14-play, 88-yard drive that took 6:42 off the clock gave Fresno State a 20-13 lead with 12:40 remaining. Jordan Mims’ 2-yard TD plunge, his second touchdown of the night, capped the drive that was set up by Da’Mari Scott’s 35-yard reception. BYU had 202 offensive yards in the first half, but had to settle for a pair of Rhett Almond field goals, and trailed 10-6 at the break. Almond’s second field goal, from 46 yards, barely cleared the crossbar and was a career-high. Hoge replaced Mangum on the Cougars’ final drive of the first half and drove the team into field goal range. Jonah Trinnaman, Beau Tanner and Aleva Hifo dropped catchable passes on the drive, including a Trinnaman drop near the goal line. Fresno State scored on its first two possessions, getting a 43-yard field goal by Jimmy Camacho and a 2-yard run by Mims, to take a quick 10-0 lead. 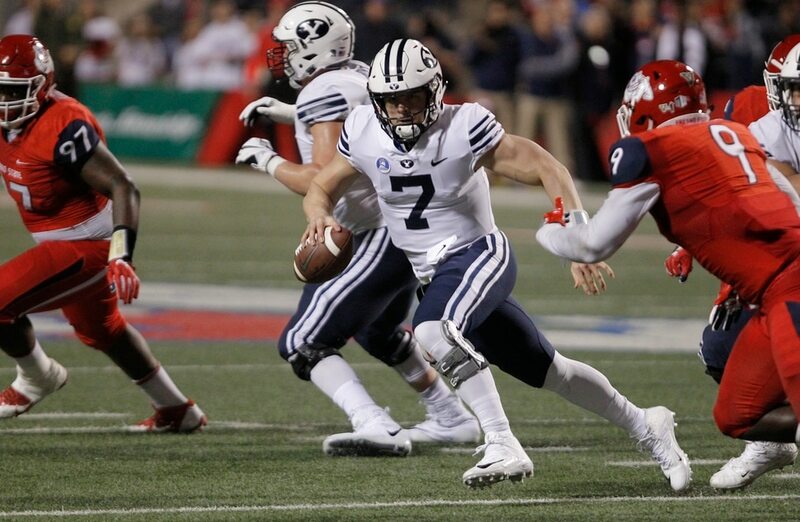 It was forced to punt on its next two possessions, as BYU’s defense held the home team to 10 plays and 38 yards in the second quarter. The Cougars return to action Friday at UNLV.